In 1980, Rick Smith discovered how to turn a huge profit out of the contents of newspaper editors’ garbage bins. His logic was that every press release an editor discards is mailed out by someone in need of a better way of getting their message into the media — if he could intercept these failed releases, he would have a list of potential clients who might be interested in a new, creative way to get their brands into newspapers. Smith, then a 28-year-old Windsor University commerce graduate living in Toronto, met with editors across Ontario who were happy to throw their piles of irrelevant or inconvenient releases in a box he would collect when full. “And I’d give them 25 bucks for that big box,” says Smith in a phone interview. He’d call the press agents on the other end of these releases to let them know he could have their pitches re-written into feature articles resembling traditional newswire stories and mail them out in a catalogue to editors who may need filler content. Instead of traditional source lines like Associated Press (AP) or Canadian Press (CP), his stories would be tagged News Canada, or (NC). Subscriptions to established newswire services were expensive — News Canada stories would serve as a free alternative. Smith and News Canada co-founder Paul Aunger, then a new journalism graduate of Toronto’s Ryerson University, discovered many of their first clients – including government clients – through this method of reverse engineering editors’ garbage bins. News Canada-sponsored stories appeared in newspapers and community newsletters thousands of times. Within years, the company was making millions in revenue with offices in Toronto, Ottawa and Montreal. News Canada now employs more than 30 people and brings in an annual revenue of about $3 million. Hundreds of private, non-profit and government organizations have paid to have their stories placed in News Canada catalogues. Especially government organizations — for more than three decades, Canada’s federal government has been one of its largest clients. Federal departments publish their contracts issued over $10,000 by default. Analysis of available disclosed contracts shows that since April 2004, federal departments have spent more than $4.9 million in taxpayer dollars to have content they co-produce through News Canada distributed to publishers, editors and producers across the country. From April 2014 to April 2015, over 300 Canadian newspapers ran more than 1,500 News Canada-supplied stories paid for by the federal government, according to the News Canada president Shelley Middlebrook. News Canada’s services also include radio scripts and video news releases, and it distributes stories in French under the brand L’edition Nouvelles. This content is published and aired thousands of times every year — and the stories never mention they are sponsored content, or who paid to have them distributed. There’s nothing new about services like News Canada, which now offers other marketing services under the name Fifth Story. Since the early 20th century, ready-for-insertion stories have been known among marketers and public relations agents as “mat” or “matte” releases. There are many companies specializing in producing and distributing these stories, but the practice remains widely unknown to the public: “mat release” is a term that appears in Public Relations textbooks but has no Wikipedia entry. Mat release stories blend in easily with regular journalistic content, but they represent an ethical challenge to publishers and producers who are increasingly strapped for cash and time. And while the new federal Liberal government has promised to increase oversight on government advertising, it continues to pay for new News Canada stories, which aren’t subject to the traditional oversight of government advertising. For Levine, the key test for determining whether a story is sponsored content or journalism is asking: “What is journalism?” Any journalism code of ethics has serving the public interest as its first principle, and Levine says mat stories don’t meet this — they’re created to serve private interests. When sponsored mat stories are published, they’re rarely in a designated advertising section. Usually, the only clue to who produced them is in the tagline. Levine, who participated in a CAJ discussion paper on sponsored content in September, says these stories are not journalism, and need to be marked that way. But it is not rare for newspapers to publish sponsored stories in their regular news content sections. In January 2015, for example, Halifax’s Chronicle Herald — Canada’s largest independent newspaper — published “How to get through tax season with a smile,” a News Canada article citing the Canada Revenue Agency as its only source. The next month, the same paper published “Careers abound in our country’s agriculture centre,” an article paid for by Human Resources and Skills Development Canada. Neither article carried a “sponsored content” label nor appear in a designated advertising or “custom content” section. Bob Howse, the Chronicle Herald’s editor-in-chief, did not respond to emailed questions for this story. Brian Ward, the Chronicle Herald’s Vice President of News, forwarded questions to Jeff Nearing, who manages the Herald’s “Custom Content” — sponsored content — section. Nearing did not respond to emailed questions. Government figures show how the Harper administration prioritized advertising spending. The maximum allowance for all government departments to spend on News Canada services increased by 25 per cent in 2013-14, from $1 million to $1.25 million. And while the government spent more than $1 million on these contracts in 2014, federal government advertising spending in community newspapers collapsed. During the 2013-14 fiscal year, the Canadian government spent almost $2.1 million on advertising in weekly and community newspapers. That’s a severe cut from the year before, when the government spent $5.3 million on such advertising. Not to be confused with the mat release company News Canada, Newspapers Canada is the organization representing more than 800 Canadian daily and community newspapers. John Hinds, president of Newspapers Canada, says government advertising has enabled newspapers to hire journalists to write stories about their local communities — fewer newspaper ads mean less money for journalists. When a federal department wants to advertise, it’s required to open up the contract to a complicated and competitive process. PWGSC, which manages all government advertising, has had a standing offer with News Canada for more than a decade. The offer is for “Multi-Media News Services,” and it enables any federal department to contract News Canada to provide content up to $1.25 million across all departments. Hinds says the process for the government to buy ads should be transparent and accountable, “which it is, but it’s also difficult” — it’s much easier to buy News Canada services. The company is popular, in part, because it can short-circuit the official “advertising” process. She writes that “earned content” refers to public relations and media relations efforts to get stories picked up or written by media outlets. Editors who see value in these stories are not compensated for running them, and the clients who pay for the production and distribution of this content are not guaranteed coverage in any specific media outlets. But with advertising, according to Middlebrook, a client picks the content of their ad and where they want to place it. They directly pay the media outlets that run their ad. To the CAJ’s Levine, the stories are advertisements even if publishers aren’t paid to print them. Objectively deciding how to label News Canada stories is complicated by the lack of any critical material analyzing the practice or history of mat release placement. Reading notices were stories advertisers would pay newspaper publishers to print alongside their regular news content, without any indication they were advertisements. As the most profitable form of advertising for newspaper publishers, the practice was widespread for decades. In her 1988 article “Advertisements Masquerading as News In Turn-of-the-Century American Periodicals,” Linda Lawson writes that patent medicine seller “Dr. Warner” of Warner’s Safe Cure has been credited with writing the first reading notice. Warner would compose fictional news stories of general interest and insert mentions of his product a few paragraphs in. One of his reading notices, for example, examined how Associated Press journalists deal with their busy lives, with a reporter mentioning Warner’s Safe Cure as the only remedy to his mental strain in the third paragraph. The story was published multiple times between 1892 and 1894 in newspapers from California to Michigan, disguised as regular content each time it was printed. In concept and appearance, Warner’s reading notices were no different from News Canada stories, except for Warner paying to have his stories appear in newspapers. Even the New York Times embraced the reading notice until the practice was discredited around the turn of the 20th century and new postal regulations in the U.S. prohibited disguised advertisements. But unlabelled sponsored stories for which newspapers receive no payment have long existed under the radar of journalistic ethics. But if free content supplied to editors and published without any disclosure fits the definition of “reading notice,” then News Canada stories would qualify, and reading notices hardly ever went away. Metro Editorial Services, an American PR firm, credits itself with pioneering national mat release distribution in 1933. Regardless of how News Canada stories are labelled, what matters practically is that in Canada, the federal government has strict outlines on how departments may advertise — and a recent government review apparently decided these stories are not advertisements. Paul Rolland, Acting Senior Director for the Communications Procurement Directorate at Public Services and Procurement Canada, oversees the standing offer. Rolland was available for a phone interview arranged by PWGSC in December after the department was emailed questions about the standing offer for this story. The interview runs just over five minutes, with a PWGSC representative prefacing the call saying Rolland soon had to be at a meeting. “We had a review of the standing offer and the communications policy, and after this review, we determined that the services provided by News Canada do not contravene the communications policy and are not considered advertising services,” says Rolland at the beginning of the interview. While it’s true no one paying for News Canada stories gets to choose exactly where the stories will be placed, which would meet Middlebrook’s definition of advertising, the government does pay to have content inserted directly into News Canada’s catalogues and website, so it is paying to ensure its articles are placed in online media. But at least seven federal departments have contracted work described as “Advertising services” to News Canada in contracts outlining they were call-ups against a standing offer. One of these contracts, in 2013, was for PWGSC itself. Details on a 2013 Public Works and Government Services contract with News Canada. Why would multiple departments repeatedly describe these services as “advertising” in contracts if a review determined they aren’t considered advertising? Rolland — speaking on behalf of PWGSC — says he cannot speak for the other departments. Does it contravene the Communications Policy for the government to pay for stories produced and distributed by News Canada that do not include government branding? There is no time remaining in the interview for further questions. 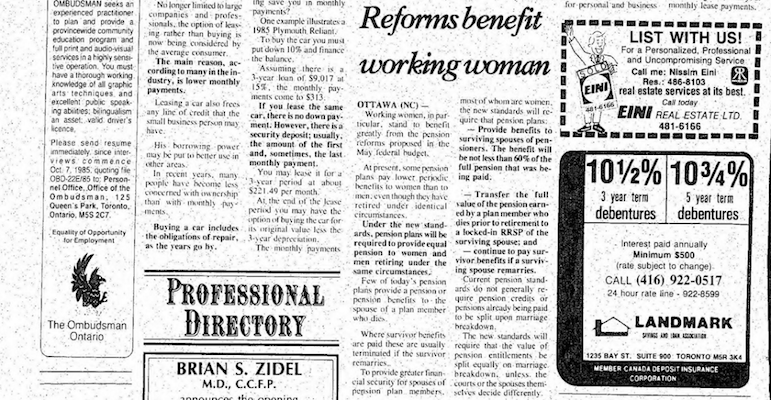 Newspaper archives reveal a history of more than three decades of Conservative and Liberal governments sponsoring a huge variety of stories, including current affairs stories portraying government decisions in a positive light. In May 1985, for example, News Canada distributed four pages of stories by Finance Canada about the new federal budget. The only interviews featured in the stories were with the Minister of Finance. Some stories from the package included no sources. A News Canada-placed story in the Canadian Jewish News; September 5, 1985; Pg. 54. Scan via Multicultural Canada. Asked whether News Canada’s 2014 stories on the Nutrition North Program or Canadian High Arctic Research Station — both paid by Aboriginal Affairs and Northern Development Canada — could be considered “current affairs,” Middlebrook replies that they could. While some Canadian newspapers may never publish mat stories, most papers are members of Newspapers Canada, which cross-promotes News Canada. News Canada has sponsored some Newspapers Canada events since 2007, and the organizations advertise each other on their websites. A promotional message for News Canada on the Newspapers Canada website. News Canada’s front page features a Newspapers Canada logo at bottom right. Newspapers Canada’s online list of partners describes News Canada as providing “ready-to-use, timely, credible and copyright-free news content.” There is no mention made that News Canada provides sponsored content. However, after Newspapers Canada learned of News Canada’s work with the government last year, it warned of the practice in an editorial on the trend of declining government advertising spending on community newspapers. Newspapers Canada distributed the editorial to its community newspaper members in August. The piece was published by papers from Quebec to British Columbia — but two different versions made it to print. The first version was the piece as it was originally composed by a Newspapers Canada member from PEI. The second version contained edits Hinds made after News Canada contested points the editorial made about their relationship with the government. The Harper government spent $1.25 million with a company called News Canada to create its own stories – stories it offered for free to print and broadcast outlets. The vast majority of these government-approved stories were never published. But you and I paid for them. It is disconcerting that the federal government spent 50 per cent more creating its own news than the total advertising buy in Canadian newspapers. The original editorial is inaccurate in saying the government “spent” $1.25 million, because that’s actually the total amount PWGSC had budgeted, and the full amount was not spent. But why was the line removed saying the “vast majority of these government-approved stories were never published”? “I took that out because News Canada went crazy,” says Hinds in a phone interview. In an email to Hinds, Middlebrook outlined “significant inaccuracies” in the editorial, writing that the line about most government stories not being approved was incorrect: 255 community papers and 58 daily papers ran 1,516 Federal Government articles distributed by News Canada from April 2014 to April 2015. Despite the ongoing sponsorship between the two organizations, Hinds reserves criticism for editors who would knowingly publish News Canada’s government-approved stories. “I think it really goes to the point of the media — what is the role of the media and the accountability function, holding government to account?” asks Hinds. But government-sponsored mat releases, radio scripts and video news releases, not being considered “advertising,” would not be subject to the Liberals’ Bill C-544. PWGSC’s current News Canada standing offer lasts until February 2017, and the new government is continuing the practice — editors have been publishing News Canada stories promoting projects of the new Liberals since January. Lorne Motley, Edmonton Sun editor, directed emailed questions about this story to Postmedia spokesperson Phyllise Gelfand. Gelfand did not respond to emailed questions. As long as organizations still see mat stories published and aired, they will still pay for them. According to Middlebrook, News Canada articles were distributed more than 50,000 times by print and digital media outlets in Canada in 2014. To the CAJ’s Levine, the ubiquity of these releases has to do with a “global forgetting” about the purpose of journalism — to serve the public interest, and not private interests. “I don’t know why it’s not more discussed. It’s a very unethical practice and there’s no doubt that editors and publishers in many news organizations, their backs are against the wall,” says Levine. It really looks like solving this problem on the front end (Government) isn’t going to happen any time soon. The mid-section probably won’t change any time soon either –they’re making easy money from what they’re doing. Looking at things from the back end, when you have the CAJ acknowledging that items like those produced by NC aren’t really credible, journalistic content, what is stopping local papers from identifying such content as “Sponsored”? I mean they’re getting NC content for free. Is there some sort contractual agreement stating that local papers aren’t allowed to highlight that NC content isn’t necessarily journalistic in nature?